4 Easy Ways To Add Bright & Filmy Touches To Your Drawing Room! Do you find yourself being melodramatic at the drop of a hat? Calling all you Desi Bollywood junkies! Our POPxo Shop has the perfect combination of sass and desi to give your living space some character. You can give your home a total makeover by adding small elements like cushions, cups and coasters. It's a great way to bring a little bit of your personality into your home. Psssst! All these are totally Instagram and millennial-friendly! Check out these quirky accessories from the POPxo shop! Dress up your couch with these cushion covers. 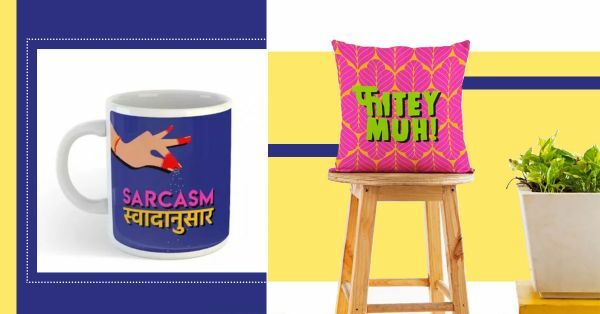 With quotes like Why, Bhagwan Why, Phitey Muh and Charam Sukh, your living room will speak volumes about your drama-loving personality. They also make the perfect gifting item if you're going over to someone's house. Your morning cuppa coffee or chai is about to get a little bit of that desi zing too. The Sarcasm Swadanusaar is my personal favourite to be drinking my morning coffee in. It instantly brings a smile to my face. Because mommy dearest will go 'Haw-ji' if you spill anything on her table! These Haw-ji coasters are perfect for all your filmy moms. Leave your bag lying around? Me too! A tote that's just as feminist as you sounds just about perfect, right? This Nariwadi tote doubles up as a shopping bag, just in case you need to haul a bunch of items on your next trip to the supermarket!